Image courtesy Nuytco Research Ltd.
Meet the exosuit. It’s not a prop from a superhero movie, although it may one day save mankind—from cancer, spinal cord injuries, and a variety of other ailments. 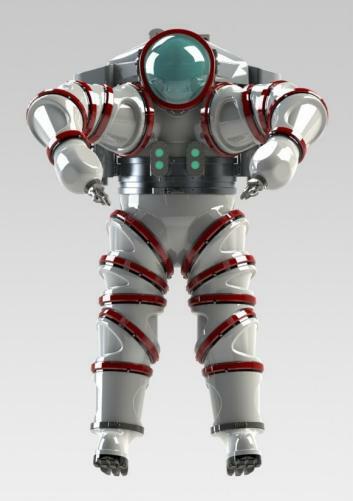 The exosuit can carry a diver to a depth of 1,000 feet while maintaining surface-level pressure. The pilot moves the device with four foot-controlled thrusters. Inside the helmet, there is a side panel displaying oxygen and pressure conditions, which are also relayed to the surface through a data link. The pilot can talk with his handlers as well. The biggest technological advancement is the rotary joint, a simple ball-and-socket hidden within several layers of technology. The oil in the chamber reduces friction, making smooth movement possible under intense pressure. A sealant and a series of wipers keep debris out. There are 18 joints, providing extreme dexterity (and making the suit look awesome). The exosuit’s arms end in stumps, to which the pilot can attach a variety of attachments depending on the mission objective, and bringing a Batman flavor to the Iron Man look. The standard accessory is a set of pincers that resemble the old Armatron robotic toy. Even an unskilled user can manipulate the pincers to pick a dime off the floor of a tank. Another handy arm attachment is the vacuum. That’s where the applications for the suit get interesting. This July, a team of scientists organized by the American Museum of Natural History will use the exosuit to explore “The Canyons,” a 10,000-foot dip located just beyond the continental shelf off the coast of New England. The suit will enable them to put a live scientist, rather than just a remotely controlled vehicle, into the murky mesopelagic zone, where fluorescent and bioluminescent creatures lurk. When scientists take turns squeezing themselves into the single existing exosuit in July and dive deep into the Canyons, they will be hunting fluorescence and bioluminescence. If they find a creature that looks promising, they can use the vacuum attached to the end of the arms to coax specimens into a container. The diver will then raise the vessel up, bringing it level with a shoulder-mounted camera and enabling colleagues on the surface to observe the catch. The scientists in the boat will even be able to interact with the specimens—for example, by flashing lights on the exosuit to stimulate a response in the creatures. It hasn’t been possible, until now, to manipulate these creatures to such a degree in their own environment, and it will help identify new and distinct species in the world of glow. It’s far from a sure thing, but the hope is to discover new proteins that will enable them to see deeper into an organism with less invasive equipment. The applications are countless: They could, for example, aid in the detection of cancer, by putting the spotlight on rapidly-proliferating cells. They could also improve our still rudimentary map of the brain. Once we know the electrical signals that cause us to make a fist or flex our knees, we can quickly build machines that respond to those commands, effectively freeing victims of spinal cord injury from their disabilities. Not even Iron Man can do that. The exosuit is on display at the American Museum of Natural History through March 5. The scientists involved in the project will give a free talk on Wednesday evening.